More commonly known as the Thompson Lake Reformed Church, the land on which the Reformed Church was built was wilderness before Daniel Secor moved from Rockland, NY and leased the lot in 1791. Before the church was built, the area residents attended church below the Hill. The church was organized March 15, 1826 at the house of Daniel Secor. The early history of the church was strictly a missionary one. The church was locally known by the name of the Secor Church, from not only having been organized in the house of Daniel Secor, but from the number of people of that name within its bounds. 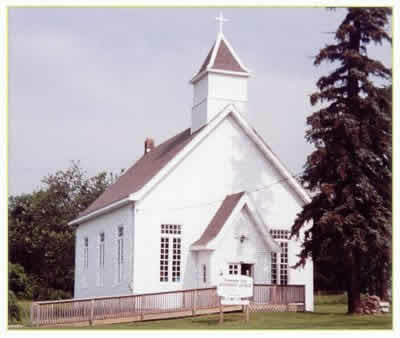 It is now locally known as the Thompsons Lake Reformed Church. This Dutch Reformed Church was a low Dutch church serving the descendants of Dutch settlers who had leased land below the Hill from the Dutch Patroon Stephen Van Rensselaer. The Dutch Reformed Church in Berne was a high Dutch (Deutch) Church that served the German speaking population that had squatted on Van Rensselaer´s land in the western wilderness of his Manor. The original church was built in 1826 and rebuilt in 1855. In 1923 the church burned and was rebuilt the following year. __________________________________________________________________________ The following is from “History of Albany & Schenectady Counties” This church was organized March 15, 1826 at the house of Daniel Secor by a committee appointed by the Classis of Albany, of which the Rev. Robert J. Slair was chairman. The meeting was conducted in due form, a sermon being preached from Mark 1, 14, 15. Twenty three members were received by certificate from the Reformed Church of New Salem, after which the following officers were ordained Elders—Jacobus Van Duesen and John F. Shafer. Deacons-Cornelius Secor and Peter R. Winne. Two children were also baptized. The early history of the church was strictly a missionary one. The record mentions the names of Revs. Robt. J. Blair, Thomas Haliday, Abram Fort and Peter Stryker, men of marked character and influence in those early days. The first minister regularly called was the Rev. Jacob R. Van Arsdale who served the church with acceptance a year and a half. In the year 1838 the church was supplied by the Rev. Hart E Waring. Under his ministry, forty one were received into fellowship, among them Jacob West, now a prominent minister of the gospel. At a meeting held at the house of William Sigsbee, in the town of New Scotland, a resolution was passed by the joint consistories, uniting together the churches of second Berne and Onesquethaw. The churches thus combined accepted for two years the services of the Rev. Staats Van Santvoord. At the close of the year 1841 this connection was broken and a union was made with the Presbyterian Church of Knox. A joint call was made upon the Rev. Joseph Knieskern, who served them with great acceptance for a period of four years. From 1845 to 1868 the church depended upon services rendered by ministers in neighboring congregations and by way of supply. Among these were Revs. George G. Sill, Jasper Middlemas, Staats Van Santvoord and James G. Cordell. In 1868 a call was accepted by Rev. William H. Ballagh, who was duly installed Septermber 3 of that year. Rev. Mr Ballagh remained here for nine years and left behind him the marks of a faithful and effective ministry. He was succeeded by the Rev. Georg M. D. Slocum, who remained five years. Under his ministry there were several revivals of religion, which greatly quickened the life of the church. The church is locally known by the name of the Secor Church, from not only having been organized in the house of Daniel Secor, but from the number of people of that name within its bounds. The church has sent forth into the ministry, Rev. Jacob West, DD now Secretary of the Board of Domestic Missions of the Reformed Church.